A new education centre is opening at one of south-west England's biggest tourist attractions on Monday. 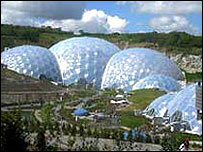 Many of the materials used to build the £15m "Core" at the Eden Project near St Austell come from sustainable sources. Architects have described the roof, made from curved wood beams and coated in copper, as striking. The Core has taken its inspiration from the plant world and has a working model of photosynthesis - showing how plants get energy from the sun. The bulk of its £15m cost was funded by the Millennium Commission with several millions being provided by the South West Regional Development Agency and Objective 1 European cash. The Core, which will be officially unveiled on Monday at 2000 BST, will be used as an education centre for the public and schools.